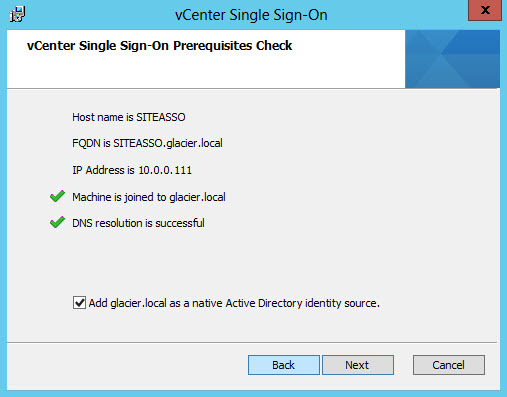 Before vCenter Single Sign-On, each vCenter Server was recommended to be joined to an Active Directory domain – one such reason was for authentication purposes. Any member of the server’s domain could be granted the ability to perform vSphere related actions. Additionally, if you wanted to use a Linked Mode view – where multiple vCenter servers appeared within a single client – it was mainly just a matter of running the wizard. Single Sign-On has changed things significantly. Administrators can now set up multiple identity sources within SSO for different LDAP or Active Directory domains. But there were new, complex challenges to solve with the 5.1 release when it came to clustering the SSO servers, especially if all you were looking for was a similar Linked Mode experience from the days of yore. 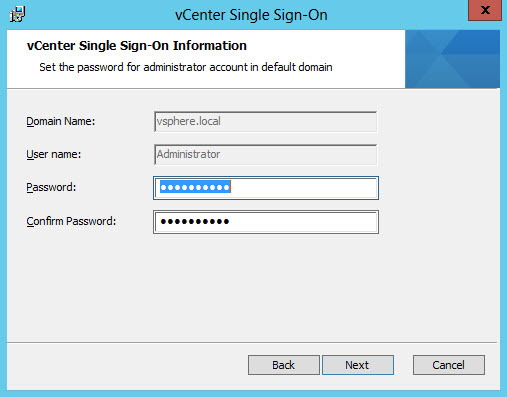 With vCenter SSO 5.5, we’re required to create a single SSO authentication domain, which ultimately means answering the installer questions a little differently than you may have in the past. This post will walk through a simple two site SSO 5.5 installation for a fictitious Site A and Site B. We’ll make sure to create a single authentication domain across the two sites by walking through the installation steps. At this point, SSO 5.5 does not exist at either site. We’ll start with Site A, which is running Windows Server 2012 and will be upgrading to vCenter Server 5.5u1. I’ve inserted the vCenter installation DVD as an ISO file and ran the installer menu as shown below. 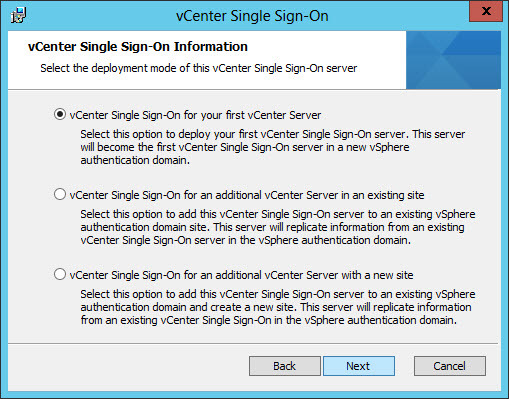 We’ll want to start by installing vCenter Single Sign-On (SSO). As you walk through the wizard, pay attention to the Prerequisites Check page. It’s something new to the 5.5 install process and makes sure that you’ve done your homework regarding requirements for the domain and DNS. Many folks forget to make the A and PTR records for forward and reverse DNS lookups. Note: Don’t just plow through the wizard. If something pops up with an error or failure, fix it! It’s 10x harder to repair later and often results in technical debt. Next up is the deployment mode options. 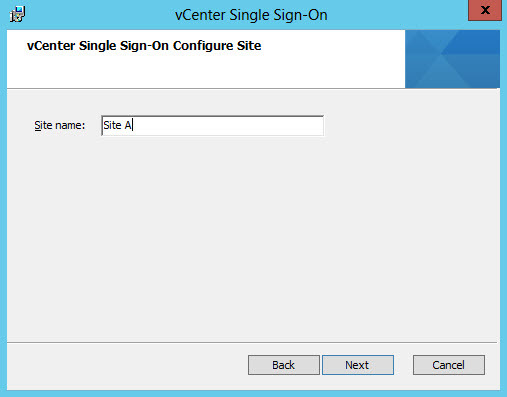 Because Site A is the first site to use SSO 5.5, I’ve selected vCenter Single Sign-On for your first vCenter Server. There are no other SSO 5.5 servers for me to add to my authentication domain site. Enter a strong password for the [email protected] account used by SSO 5.5. It must contain a lowercase letter, an uppercase letter, a number, and a special character. Not all special characters work; I tend to use a “!” to avoid complications down the road. Now it’s time to name the site where this SSO server is going to live. This is Site A, so I’ll just enter that. You could also call it the name of the city where the server lives or the type of environment if you use multiple SSO servers at a single physical location. Finish the wizard and install SSO 5.5. 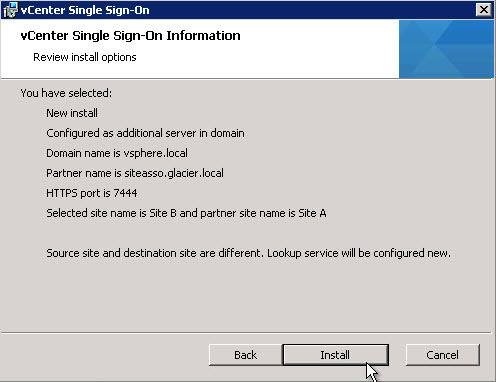 It’s now time to install SSO 5.5 at Site B, which runs Windows Server 2008 R2 SP1. Most of the SSO 5.5 install at Site B will be the same wizard activities, so I’ll focus on covering the differences. 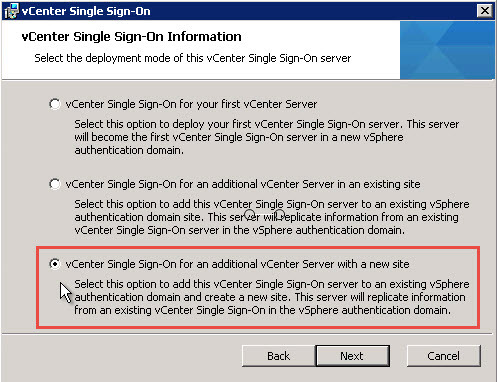 To begin, the deployment mode for Site B will be vCenter Single Sign-On for an additional vCenter Server with a new site. This allows the SSO domain to include a new server rather than creating islands of SSO instances. Once the wizard is done installing you’re free to install or upgrade the other vSphere components. Now that there is a single SSO authentication domain, any changes made to either site will be replicated to the other. This reduces the operational efforts for the IT organization. We’re also empowered to use vCenter Linked Mode to create one logical management point for any reasonable number of vCenter Servers. We’ve touched the tip of the iceberg here. You could have many different sites, or multiple SSO instances at the same site, or a mixture of the two. I really enjoy how simple the installer is and the fact that the sites replicate with one another without any need for scripts or witch doctor rituals. Just make sure to use the vSphere Web Client 5.5 if you want to view or edit the SSO configuration and identity sources. Hi, is it still a 1-1 relationship between vCenter Server and SSO instance. 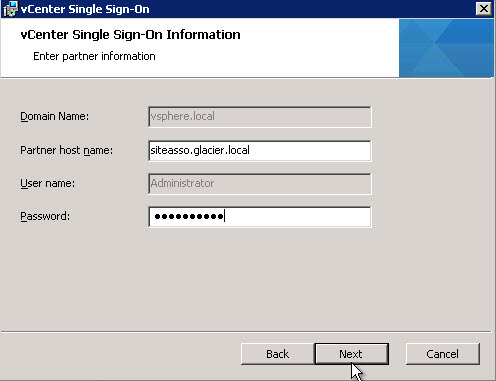 If i point vCenter Server A to SSO siteasso will SSO sitebsso take over the authentication process for vCenter Server A if SSO siteasso becomes unavailable? Good question. I haven’t yet set up this scenario in the lab, but from what I understand it is a 1:1 relationship (based on the fact that the SSO server FQDN is hard coded in the config file). If you wanted to use multiple SSO servers, you could use a load balancer. The main point of an SSO authentication domain is to create a single layer of configuration across SSO nodes and sites. Are there geographical limitations for a configuration like this with relation to the distance between the two sites? Great article. Thanks for the informative breakdown. Dan S – none that I am directly aware of. Hello Chris, can this be done between SSO’s installed on vCenter Linux Server Appliances? I believe you can chain multiple vCSAs to a single vCSA for SSO purposes, but I have not tried creating a distributed SSO domain on the appliance. 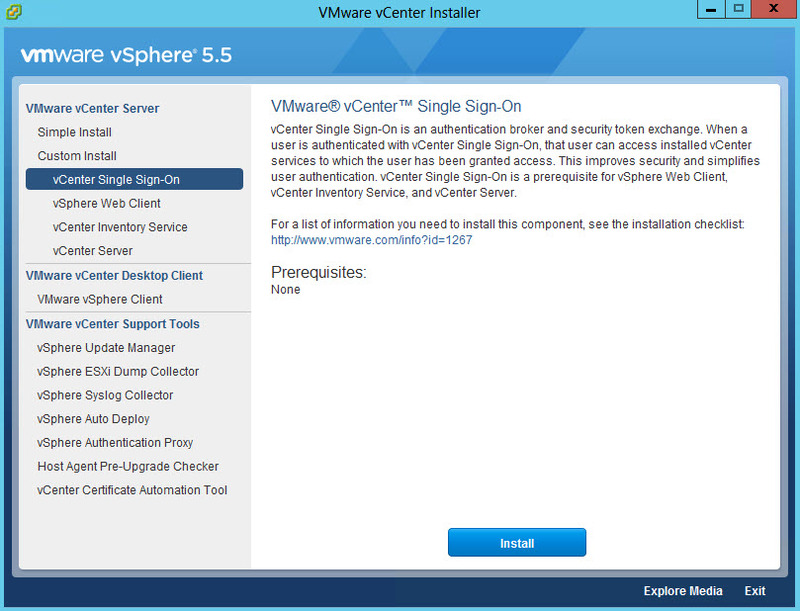 VMware’s SSO creates its own domain – which is vsphere.local in 5.5. The setup and configuration of the identity sources, which are the user domains, are outside the scope of setting up the SSO domain. What if you wanted 2 vCenters within the same site? would you select the middle SSO deployment mode option? Other than “add to an existing site”, what else does it do? You mentioned ” islands of SSO instances”, can you elaborate on that? Also, I’ve never been able to find what VMware constitutes as a vCenter “Site”. Is it similar to an AD site or just a way to separate location? You could point both vCenter Servers at the same SSO instance, or deploy an additional instance of SSO in the same site. Sites are the naming used by ADAM (AD LDS), which is used by SSO. It defines a logical namespace. When the vCenter(SiteA) is down… I cant login in my second SiteB vCenter using my AD credential event with [email protected] ? Yeah That is what I saw.. using ssolscli command is listing me a lot of registered services and seems to point on bad Name..
Have vCenter for each datacenter?. Do I need multi site SSO (additonal Vcenter new site option 3)?linked mode ? Have vCenter for each datacenter? stand alone SSO for first vCenter?